I agree with Jeff when it comes to buying likes. After all, many businesses purchased likes in their early days on Facebook. These likes often came from sneaky tactics that were really about buying page likes to grow your fan base. Buying fans meant those who had liked your Business Page were usually not potential customers. This was frequently because they either lived far outside the market area for your business, like in another country (India, Eastern Europe, etc.) The high fan numbers looked good on your Page, but they had little impact on your business or the success of your Facebook Page. Of course, many other Page owners used paid advertising to reach a targeted group of consumers relevant to their business to build their Page likes and fans. And really, this is the only strategy that made sense long-term. But purchasing likes for your business Page is a lot different from paying to market your best content to a widely or narrowly targeted group of consumers that could be potential customers. And there lies the difference. If we are willing to pay for people to LIKE our Page, often amounting to hundreds or thousands of dollars over time, and often to groups that have no potential of being our clients. Why is paying to reach targeted groups of fans and consumers in their news feed, with our best content, such a hard pill to swallow? Especially when it too can grow our fan base, albeit slower. For some businesses, having to pay for Facebook means that it is no longer the best place for them to spend their time and money. If that’s the case, they probably shouldn’t have been there in the first place. However, for many businesses, Facebook IS still the premier social network for their brand. For these businesses, paying to reach their existing fans and/or those who are not yet fans on Facebook is a good business decision that can help build their brand and online reputation, and drive business to their website. And it doesn’t need to be expensive. For instance, Facebook offers huge opportunities to real estate agents – mostly unrealized – to build their reputation as professional, knowledgeable and successful. Thus making them more attractive to those looking to buy or sell their home. It can be a great place for realtors to share new listings and helpful tips for home buyers and sellers. That is if their posts make it into the news feed! In order to ensure that, they’ll need to pay. A client who is a realtor in a large Canadian city spends between $5 and $15 to promote each of her new listings on Facebook. Her fan base is around 350 but she targets beyond this base to anyone in her city who is within a certain age bracket. The price of getting broader exposure for her listing and her name was relatively cheap, considering the exposure and the action viewers took. For many smaller business owners, an investment of $40 to $100 a month can make a huge difference in getting their brand name in front of consumers and having a positive impact on their business reputation, and ultimately their business. That assumes they’re sharing content those they are trying to reach want to see. Is Facebook a good fit for your business? Whether Facebook is a good fit for your business or not depends on various factors. Are the people or businesses you hope to reach active on Facebook? Do the products and services you sell fit with the audience you hope to reach on Facebook? Usually, only a small percentage of those viewing a post in the Facebook news feed will actually comment on, share or like your content, even if it is great content! That doesn’t mean it isn’t having an impact. Just showing up in the news feed of your fans helps build brand name recognition. What determines whether that recognition is good or not is the quality of the content you are sharing, in the eyes of those seeing it in their news feed. The Social Media Examiner article 10 Big Brand Facebook Tactics Any Business Can Use offers some ideas on what to post and how to make it engaging. It’s easy to boost posts on your Facebook business Page. Just click the ‘Boost Post’ button that available when you are creating your post and before you click the Publish button. Then select your budget, targeting options and the duration of the promotion. This is a good way to ‘test the waters’ with your best content. Be sure to share content you think consumers will find interesting, helpful, informative, inspirational, etc. For more advanced targeting options, promote your posts through the Advertise on Facebook page. 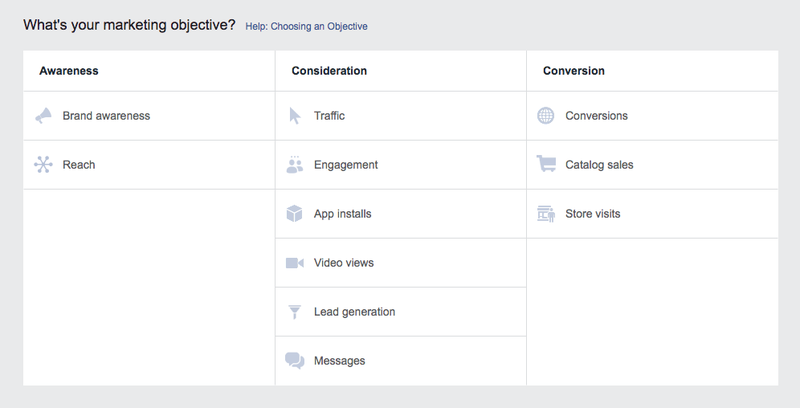 The Advertise on Facebook page lets you choose your marketing objective (see below)and then walks you through the process of setting up an ad. When posting on Facebook, remember that most people are there to connect with family and friends, not brands. Some brands are a more natural fit for Facebook, while others are not but can still do well. It all depends on who you are hoping to reach, the quality of the content you are sharing and whether you are willing to pay to get your posts and brand in front of those you hope to reach. This article has been updated since originally written in 2014.